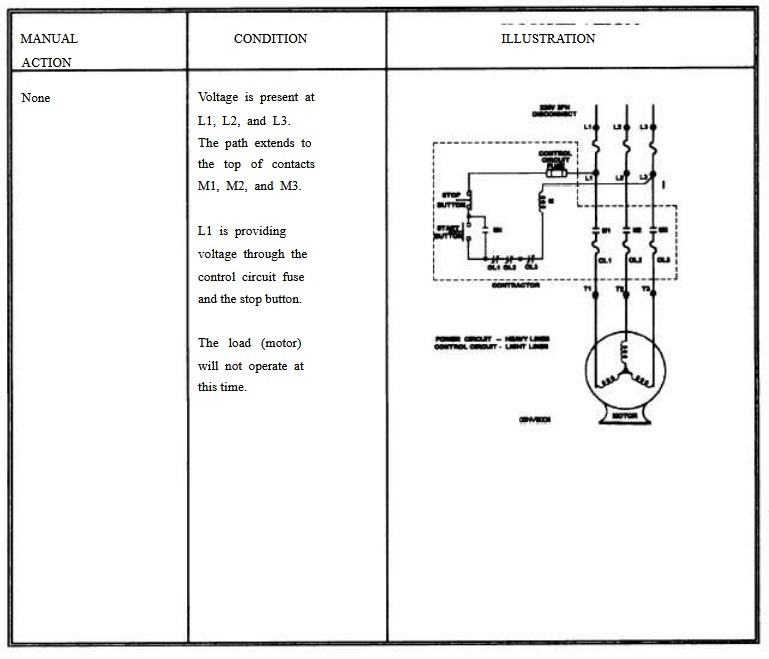 of the same motor control system shown in the other three diagrams. It is laid out so the process of operation is easy to trace. The schematic is sometimes called an elementary or a single-line diagram. It is also useful for troubleshooting purposes. To understand the electrical operation of figure 4-8, you must be able to identify all of the components in the figure. L1, L2, and L3 are the three phases of power. The control circuit fuse is placed in the path of the beginning of the control circuit. Therefore, when excessive current is drawn through the control circuit, the fuse will blow and open the path. The M coil is located in the control circuit, which, when energized, changes the position of contacts labeled with an M. OL1 and OL2 are in- line fuses in the load circuit which protect the motor. When OL1 or OL3 opens due to excessive current or too much heat, contacts OL1 or OL3 open, causing the M coil to be de-energized. Follow the logical sequence in table 4-1. It shows the electrical operation of this simple, but actual design, you will see in the field.